I search Facebook in due diligence investigations, to develop background on parties and witnesses in civil cases, to find relatives related to genealogy and probate matters and to gather photos. The Facebook Graph search tool by NetBootCamp can guide you in all of these. To find users who interact with a particular page, grab the page ID and enter it in the field at the top of the NetBootCamp site. If the Facebook URL for that page doesn’t display the number, select the link and enter it at Find My Facebook ID. That will return a number that corresponds to the page name. There may be more than one page that corresponds to a particular entity. For example, there is one page for San Mateo High School and another for San Mateo High School District, which encompasses the high school. Enter the number in the field at the top of the NetBootCamp site and it will populate the school page ID fields. Find current or former students at a particular school. There are additional and different names at the alternate school page. 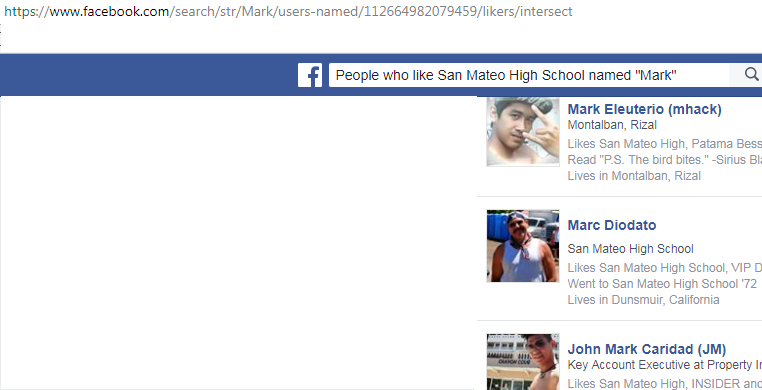 Find people who “Like” that school page and refine the results searching a partial name.